Simpo PDF to Word is a batch PDF converter with easy-to-use interface. It help you convert PDF documents to editable Microsoft Office Word files or Text format. Convert PDF to Word (*.docx or *.doc) will preserve all contents, images and layouts, and it will save you the time to compose the material again. Convert PDF to Text will only extract characters from a PDF document and save as plain text, txt format, and with a faster conversion. Note: Run SimpoPDFtoWordPortable.exe to launch Simpo PDF to Word Portable. 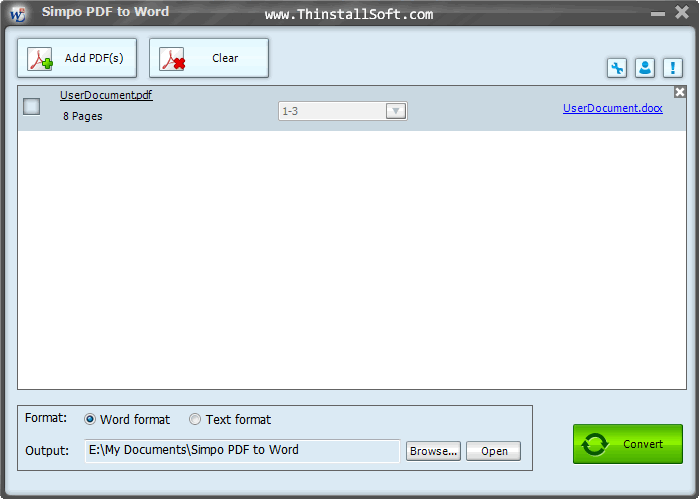 The current version is Simpo PDF to Word 3.5.10 Free Giveaway Edition. We have also coverd some other Simpo products such as Simpo PDF to PowerPoint, Simpo PDF Password Remover and Simpo PDF to Text. You could also try other quality PDF converters including First PDF, PDFMate PDF Converter Free or Some PDF to Word Converter. What's new in Simpo PDF to Word 3.5.1.0? 500% faster speed to convert your PDF to Word documents. Accurately compose the contents while converting PDF to Word, so that you can spend less time formatting the converted Word. This entry was posted in Office & PDF and tagged pdf, pdf converter, pdf to doc, pdf to docx, PDF to Text, PDF to Txt, pdf to word, pdf2word, simpo, simpo pdf to word. Bookmark the permalink.